it also comes with the all new Aspire Cleito Pro tank, which is just as flexible as it accepts coils from Cleito and Cleito Exo tanks. The Puxos can be used in various modes, allowing you to select between Wattage, Voltage, Bypass, CPS (C1/C2/C3), TC(Ni/Ti/SS316L) and TCR(M1/M2/M3). Looking good Aspire. Replaceable face plates to change the look of your mod. A 21700 battery is a plus. And the new Cleito Pro tank, I'll over look the small juice capacity since it looks easier to fill than the other Cleito tanks. Thanks for making easy to fill tanks that aren't the screw on type, my disability thanks you. I will wait for a dual battery 21700 150W+ mod. With that said, I do like the design of this mod. Might have to pick up the tank though. Can't have a Cleito collection and leave one out. 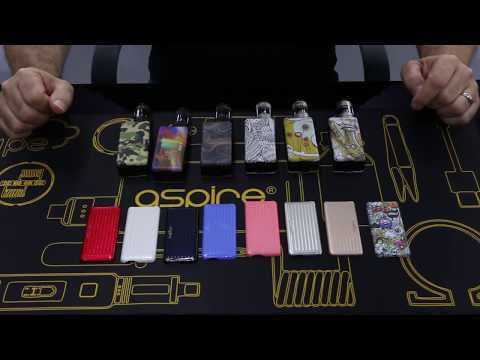 My video review of the new Aspire Puxos kit. Since I do not have the time to make the video I wanted to make, I will just say my thoughts here. I purchased my kit from a shop that decided not to carry the mod due to the cheap plastic feel of it and a few other things they noticed. They sold me the kit at their wholesale cost of $60. First off, I will say that there are quite a few things I like about the device and quite a few things I do not. First off, the feel of the device is quite cheap. I understand that it is a glass reinforced plastic substrate that gives it some strength , but it has the same feel as when you get a really cheap knock off drill or something similar. I knew this when I bought it at the store so I am willing to live with it but it is not the same quality feel that I expect when I think of an Aspire product. After using it for the few weeks that I have, you do not notice it as much. The paint on the mod is also not very good as I did have some pocket wear on it within a day of use and some of the paint did come off around the edges and some of the ridges. There was not enough to detract from the look of the mod but it happening so quickly was a little bit of an eyebrow raiser. The side panels of the mod seem a little flimsy and have quite a bit of give to them. It makes them seem more cheaply made than they really are. As with all that said, and one of the reasons I have waited so long post a review on it, the device is much more durable than it seems. I have dropped it off my lap, it has gone flying off the seat in my work van, slid around in my work van and other mishaps that have happened and it still looks pretty good and is holding up quite well. It is much more durable than it looks and feels and I will give Aspire props on that. The magnets and how the side panels are designed make it so that they hold quite nicely and they are hard to pop off accidentally but are easy to take off when you need to. One thing that is really annoying about this mod is the battery compartment. I understand that it was made the way it was to keep the battery from accidentally popping out when you drop it but it could be just a little bit taller. When putting in 21700s or 20700s into the device, the fit is so tight that they go in easy but they are kind of hard to get out. Another thing that I wish this had was upgradable firmware. The battery meter seems very inconsistent with what the battery charge actually is. I have confirmed this by taking a freshly charged Aspire 21700 and an iJoy 20700 off of my Nitecore D4 and with having a multimeter reading of 4.18V to 4.2V, I have plugged in the USB to charge it to see what the device says the battery reading is and I get anywhere from 85% to 90% charged. I first suspected this when my battery drain on the normal meter on the lcd screen was showing the battery draining quite quickly. The device will show 50% battery life left but I have greater than 50% left. I am not sure what the cut off for the device is as I have tried to get that low by using my Revvo tank and then my Cleito Pro tank but even with the battery meter showing completely drained, it was still going. Also, the mod does not always recognize a new tank when it is put on so you have to back it off, fire it so it shows no atomizer and then it will recognize it. Along with all of that, not being able to change the Wattage on TC mode is one the biggest annoyances I have found with it. I wish Aspire would have just used the much praised latest Speeder Mod firmware and modified for use with this device. The menus on that firmware make it so easy to set and use and all the features you really need for TC are there and it works perfectly. It allowed for the best SS316L Cleito coil experience I have had. Now I get the 2nd best but the hit is harder than I would want it to be since I cannot adjust the Wattage in TC. With all of this said, what do I like about this mod? It is small and comfortable to hold. It fits nicely in my pocket. In Wattage mod, it has one of the best and most consistent hits I have had out of the number of devices I own. I can only attribute this to the Aspire battery that was included with this mod. I have used both the Aspire 21700 and an iJoy 20700 battery in this device and it was night and day going from an 18650 mod to the 2x700 mod. I can only attribute the fact that I am getting a higher Amp draw from the battery and am able to power the tanks with the Amp draw they need to run without the batteries sagging. The Aspire battery is actually much better than the iJoy and I do get better results with it. Running a Revvo tank with a coil that is at 0.13 Ohm and is needing 25+ Amps to power it, I would not think of running anything other than a dual 18650 mod or you would drain your batteries pretty quickly. Not with these batteries. Also, I love how lightweight the mod is. It practically disappears into your pocket and I have to wonder if I left it in the van or if it is behind something in my pocket. Now since this is a kit and has the Cleito Pro with it, I might as well talk about that. I love it. I love that Aspire included the bubble glass for it as an optional use with the kit. A lot of shops do not carry the extended capacity tanks(hence why my Cleito 120 doesn't have one yet, I keep forgetting to add that to my orders) and it allows you to choose what capacity you want the tank to have. The air flow is very nice and compares with EXO quite nicely. I have not used a SS316L coil in this tank yet because I am still using the one that was in the tank when I bought the kit and it just does not seem to want to die. The side fill has been very nice, especially with being someone on the go all the time for work. I love this tank. Now with all that said, would I recommend this kit and mod to someone? Yes and no. The reason is that the Puxos is definitely not for everyone. Chances are I would recommend a different mod or tank but it would depend on the person what their needs are. I am finding this as my daily mod that I grab and use all the time. More than some of my better mods but usually I am running higher Wattage tanks on those. 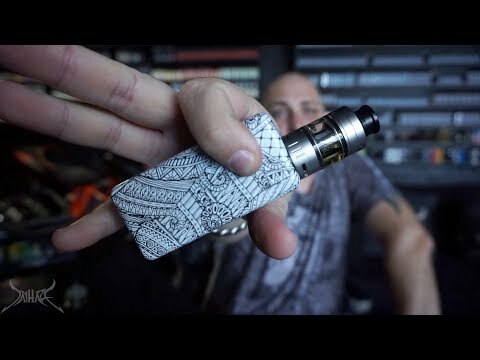 The Cleito Pro does pair nice with this mod though and so does the Revvo. As an Aspire device, I am disappointed with many aspects of it and am still amazed that this is an Aspire mod, but I do like it at the same time even with the flaws that I have outlined. I am now looking at the Dynamo kit and am hoping that it will be the mod that I really am looking for. @Tina This mod is so responsive that all I would ever get was the flip/brightness screen. I finally got it to come up but it was such a fast press and let go to get to. Nice video. That part you said about the tank heating up, do you think that's bad. When I vaped endlessly on my Atlantis 2 that's what I strived for, oh my juice tasted so good when I got the tank and coil to heat up. The mod would also heat up which I didn't like. Thanks! The heating up of the coil at 60-80 watts is not necessarily a bad thing. I just noticed it where I hadn't maybe taken notice before. But as I said. it is a sub ohm coil and they will generate heat at higher wattage settings than say my regular Cleito at 40 watts which is what I usually DTL vape on. @charlzrocks thank you for the detailed review. I like the puxos, is the perfect replacement for my single battery and super strong nx75 but there is no statement about firmware upgrades capabilities , i really care about having this feature . all my aspire mods, apart the first one like the pegasus, have it. Anyone know if is or isn't upgradable? So I bought this kit even though I said it really was not a device I was wanting and it was pretty much not really geared for me. My Speeder's door finally does not want to stay latched all the way(not the doors fault, it is fine) so I wanted another Aspire device for my SS Cleito coils and since Aspire usually has really good TC with SS316L with those coils, I decided to pick it up since the shop I got it at decided not want to carry them and I pretty much got it at a really good price. The Cleito Pro is quite nice. I will be making a brutally honest review of this device in a video soon. I bought an I Joy 20700 battery to compare with the Aspire 21700 battery and its performance in this mod. I do not want to say I like or hate the mod at this time, but there are some things about it that I already do not like about it and hopefully the video I make will help Aspire in the future with similar devices. Surprisingly though, it does hit better than expected and functions perfectly fine. Hello Everyone, Guess who's back and I missed you all. I have upgraded to the PUXOS and my observations are good and bad. Overall, I like it but if I could make a suggestion...Please don't use plastic ever again, it looks and feels cheap. I like the tank better than the Mod and that would have been my preference if it were available at the time. I am still an ASPIRE junkie and always will be. You know, whenever I see that someone says that a tank is a "Juice Hog", all I can think of is "How do they think the tank makes so much more vapor? Because it uses more juice!" People should really think about how things work before they make such remarks. :-B As far as the plastic housing and plates....I like the light weight of the unit. You can tell by the coil the Puxos will use a lot of juice, I never said it was not a good vapor maker. However, there are vapers out there that are concerned about the amount of juice used in one day and in my opinion, this mod qualifies as a JUICE HOGG. So yes, I thought about how it works and this is NOT my first mod but in comparison, this one uses up the most juice. As far as commenting, I will be honest and not blow smoke up someone's behind if I don't like something. I was constructive and courteous in my criticism and spent my hard earned money on this mod. So I have a right to my opinion and you have the right to disagree but to say "People should really think about how things work before they make such comments"....Are you going to replace my mod when it breaks on the first drop on Concrete?? If you would have done research (read the reviews on the mod and the description on the Aspire website) prior to purchase, you would have known it was a lightweight plastic body. If you drop it on the concrete, it's nobody's fault for breakage but your own. My coments on "How things work" was in regard to the "Juice Hog" aspect of your review, not the plastic body. To each their own, however I do agree about the tank getting hot. I replaced my coil with an original Cleito coil so as to vape at 40 watts. I too like a cooler vape. There is a difference between a "lightweight plastic body" and "will this break in my hand" type of plastic. Durability is the issue with this mod. Also, don't you think you are taking my comments a little too personally. My comments were "my opinion" based on my current experience with it. Anyone is capable of dropping their mod and I noted that this particular one probably will not last past the first drop. If you can't handle a simple critique and suggestion...that's your issue, not mine. Currently in Day 3 with the Puxos and I am liking the tank more, adjusting to juice consumption( I believe the coil is finally saturated) and still giving the body of the unit the "side eye". We need a Puxos 2 for the more accident prone vapers. @milmil0428 Thank you for your personally review,we will pass your feedback to our R&D department. Pretty great review there @midnightwolf !! First, got the tank week ago and I was loving it so far. Until one day I forgot to lock it and while I was siting the fire button pressed and the rig made hole in my pocket!!! Why did you not put 10s fire cap? Most mods I've seen have this. Please include this in future firmware release, this is serious safety risk. And please dont tell me that mod is not firmware upgraedable, just upgraded it few nights back, firmware is listed to download on your website. You forgot to lock it. Or, you forgot to click it 5 times to turn it off. That is the safety feature. I know I did forget to lock it, still haven't seen mod before that hasn't got 10s (or similar) cut out, maybe apart from some cheap mech mods. It is simple enough feature and there is no reason to not to have it. This actually could end up much worse if the battery overheated in my pocket due to this. Actually I've double checked - Automatic cut-off is listed on the safety features. Question is why isn't working? If it was firing in your pocket, that means the fire button was being pressed, most likely repeatedly over a span of time, the auto cutoff feature was most likely triggered multiple times! And, being in your pocket for who knows how long...the tank would have heated up as well as the rest of the mod. As far as the firmware upgrade possibly not having the protection features, that would have to be addressed to @Tina and the team at Aspire. I am not saying that it couldn't happen, I am saying that there are other factors possibly at work in your circumstance. This is one for the Aspire tech department. The Puxos mod has the protective function, users can adjust the continuous fire time from 1-15 seconds. from 01 to 15 seconds by pressing the up or down button.